Occasionally I return to a suburb to housesit, sometimes for the same homeowner, sometimes for another. But Thornleigh in Sydney’s far northern suburbs was a first for me: I housesat in three houses consecutively, all within the space of a couple of hundred metres on the same side of the street! I was initially booked for one residence for a period of seven weeks (reference still on the way for that one), but before I’d arrived, the homeowner had been chatting to friends three doors down, and they booked me in for another couple of weeks to follow directly after the initial housesit. Then while I was there, we jointly agreed on my filling in for a few days in between at the house directly next door to the initial housesit. This was very handy as late May to mid August, my transitions allowed me to pack my bag and move next door and then subsequently just four doors down. My Opal transport card got to feel extremely neglected. This reference is from the last of those housesits, looking after a very low-maintenance greyhound who loved her walks and the occasional visit to the dog park, loved that I was around most of the time, but made very few demands of me. Meanwhile, the moggie thought she too was a dog, and would follow me around from room to room and outside, wanting to know what I was up to, and always jumping onto my lap every time I sat down. Which was a lot, coming as it did while I fought off a very rare but rather persistent cold, and while I watched the end of the 2018 World Cup and all of the 2018 Tour de France, two of my absolute addictions. In fact, the greyhound even found her way onto the SBS TV coverage one night when the producers featured one of my pictures from the very lively #sbstdf and #couchpeloton Twitter groups that watch and analyse the annual classic road race, mostly with tongue firmly planted in cheek. The cows, field art, chateaux, and gastronomy of the various regions are up for as much discussion as the race itself. We’ve just returned from 4 weeks away with Bill housesitting for us, caring for our Greyhound, Carrie and elderly (and slightly demented) cat, Abby. 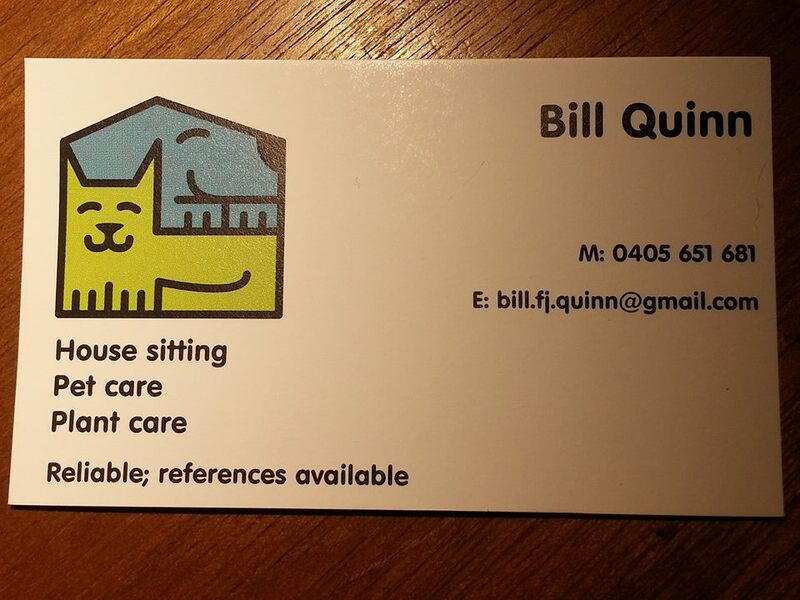 We can’t recommend Bill enough. He took Carrie for long walks daily and put up with Abby stalking him, wanting to constantly sit on his lap. Communication while we were away was easy and reassuring. We returned to a very clean and tidy house and two happy healthy animals. Perfect.